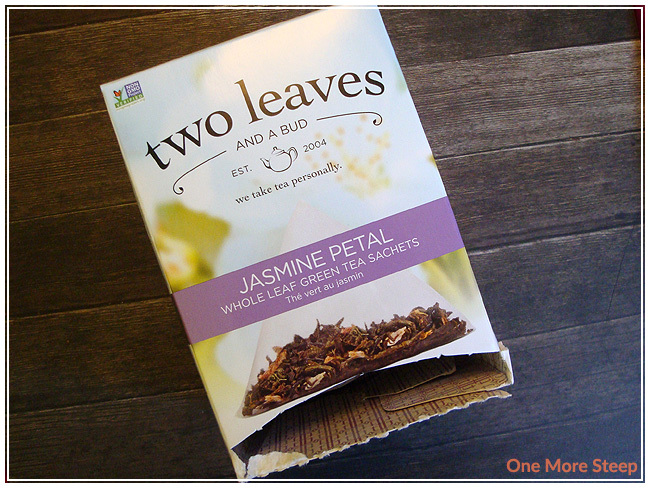 I received this box of Two Leaves and a Bud’s Jasmine Petal as part of a swap, so it did get a little bit crushed in the packaging. 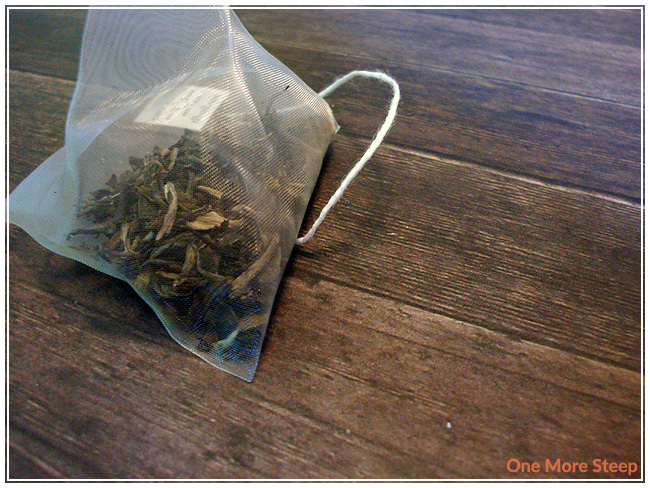 Each tea sachet comes individually wrapped in a clear plastic wrapper. There is some print on it that tells you the name of the tea and type (Jasmine Petal; whole leaf green tea) as well as the caffeine level (light) and steep time (3 minutes). At the bottom it states “compostable tea sachet” which is something important because I always feel bad if I have tea in a sachet that can’t be composted (can I really enjoy tea if I’m contributing the landfill?). The sachet itself is a pyramid with a handy string to fish the tea back out. 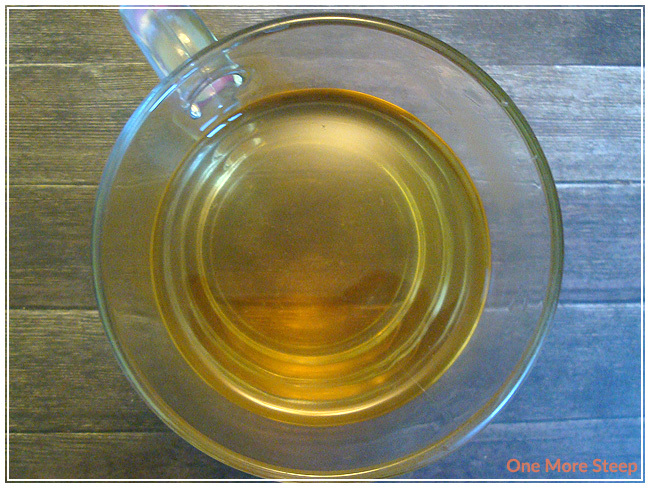 It smells amazingly floral – it has a very bright and strong jasmine scent to the dry tea. If you look in the tea sachet, you can see fairly large tea leaves in there. No fannings or dust for these tea sachets, that’s for sure. The side of the box states that the ingredients are from China (ingredients of Jasmine Petal are: green tea, jasmine flowers). The other information includes the fact that the tea has about the same amount of caffeine as a third of a cup of coffee, to use water that is 180F and to steep for 3 minutes. Two Leaves and a Bud recommends steeping in 180°F (82°C) water for 3 minutes. 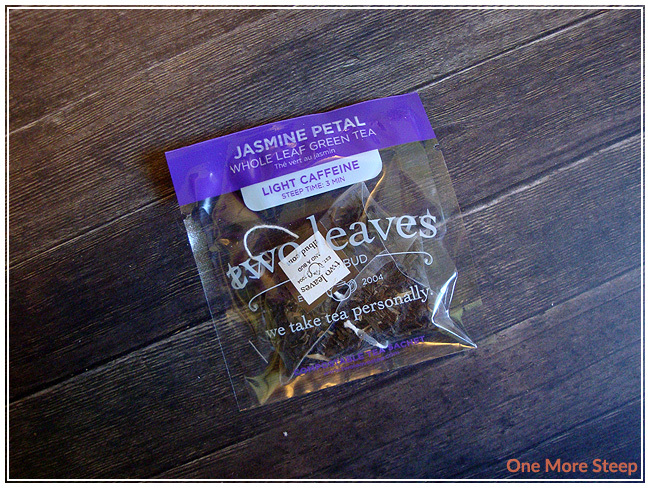 I steeped Jasmine Petal for about 3 minutes. It steeps to a familiar yellow colour that I’ve come to expect from a green tea. It smells amazing, the jasmine scent is a lot stronger in Jasmine Petal than in most jasmine green teas that I’ve tried before. I think this is because it contains jasmine flowers, rather than just having been scented with jasmine flowers. The tea itself is quite nice. It’s got a smooth taste to it, with a touch of bitterness at the end of each sip. I think 3 minutes might be a little long for this tea, I would try it again on a first steep at maybe 2 or 2.5 minutes to see if that makes a difference. The bitterness isn’t terribly off-putting because the tea itself still has a great flavour. The jasmine taste isn’t as strong as it smells, but I don’t mind that too much because I’d prefer to have my green tea tasting like green tea. I tried resteeping the sachet and it didn’t do too well. While the sachet uses whole leaf, it just didn’t do as well as I would have expected for a sachet that uses whole leaves. The second steeping was weak in flavour and aroma. I thought that Two Leaves and a Bud’s Jasmine Petal was just okay. It makes for a good cup of jasmine tea, and I really appreciate that Jasmine Petal contains jasmine flowers instead of green tea that’s been scented with jasmine flowers. I think that 3 minutes is entirely too long to steep this tea for, because of the fact that it begins to get bitter and nobody likes a cup of bitter tea usually. I would have rated it higher if it had more appropriate steeping instructions. Overall, I think that Jasmine Petal does okay as a jasmine green tea and I will definitely have another cup again, but I don’t think I would buy it when there’s so many jasmine green teas out there that don’t give me too long of a steeping time in the instructions.